"Nobody knows how long it takes to kill an olive. can leave the trees seedless for years; they revive. through the burnt-out ribs of siege machines. go under, waiting another age. Their shade lies where Socrates disputed. Gethsemane's withered groves are bearing yet." - "The Olive Tree" by Mark O'Connor, Collected Poems, Alexandria, (N.S.W. ), Hale & Iremonger: 2000. 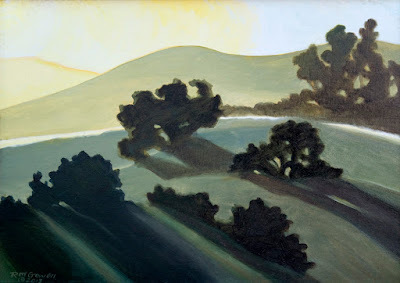 Perhaps it was because I had been thinking about olive trees, but when I looked at Robin Gowen's painting Shades of Shadows VI, I thought what a civilized landscape. The trees and, even more, the hedgerow in the background at right are signs of a well tended meadow. And the light washing over everything could easily be the light in Provence although it is not. Lost in the labyrinth of history, the Olea europea, or edible olive, was first collected in the wild, probably in the Levant; certainly it is one of the earliest cultivated crops that we know of. Evidence that the olive tree was farmed successfully on the island of Crete dates back to c. 3500 B.C. The oil of the olive has been sacred to many cultures. By the time of Homer (c. 900 B.C. ), olive oil had become a luxury good, used to anoint the human body for ceremonial occasions. (An olive tree appears in Book XXIII of The Odyssey, being the center post of the marriage bed). In The Odes (c. 13 B.C.) the Roman poet Horace testified to the olive's delectable qualities as food: "As for me, olive, endives, and smooth mallows provide sustenance. According to the Bible, it was an olive leaf that the dove brought back to Noah's ark. Mark O'Connor (b. 1945) is an Australian poet who has collaborated on projects with nature photographers. Robin Gowen (b. 1957) is an American artist who was raised in New Hampshire and Nigeria. In recent years she has moved around the western United States. Robn Gowen - Shades of Shadows VI, 2017, Sullivan Goss Gallery, Santa Barbara. the bold works of the giants decay. Reefs have caved in, towers collapsed. Hoarfrost clings to the mortar. Caught between the Romans and Christians; caught between a thousand year old organization of space and a new one taking form that we are too immersed in to fully comprehend, we are of (at least) two minds about the vernacular landscape we have made. 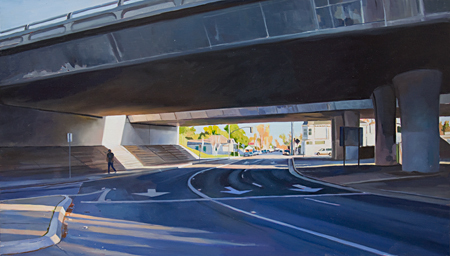 Superficially, they may look like street photography, but the paintings of Patricia Chidlaw are the creations of a different sensibility in a different medium. A photographer may choose among negatives for the best one and that one may implicitly refer to moments before and after the picture was taken, whereas a painter works - and reworks - a single canvas until it satisfies her intentions. 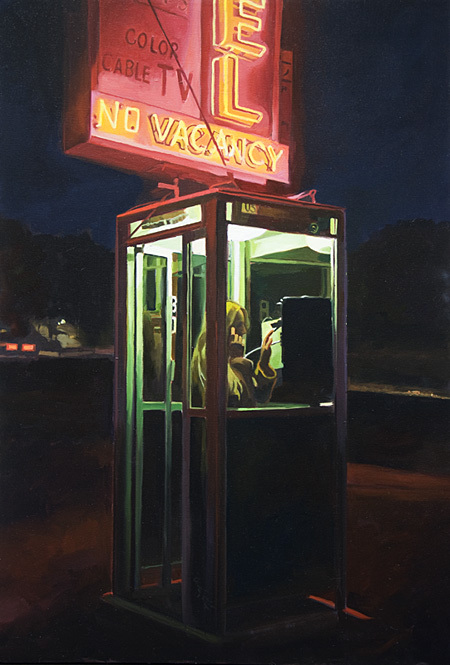 In the current exhibition Patricia Chidlaw: The Moving Picture Show at Sullivan Goss: An American Gallery in Santa Barbara, California, the show in the title is often viewed from the vantage point of an implied passerby, possibly on foot but more likely inside a car. This immediately gives us a sense of the familiar, that we have seen these places before. But look longer at many of the paintings and you notice that time is just as much their subject. The clock was introduced in Europe circa 1300 and the coordination of times from place to place was a byproduct of the demands of modern transportation, specifically of the railroads. Paul Tillich, theologian, defined tragedy as coming from the gods of space, whereas justice belongs to "the God who acts in time an through time, united the separated spaces...."
And so a question arises: do we value a sense of space more than a sense of time, the medium through identify the brain as the seat of sight. Whichever side of the question one comes down on, there is widespread agreement that roads disturb the peace and cause radical change by muting the distinction between the private and the public. In Under the 280 an elevated highway casts a mammoth shadow over its surroundings and also functions as a de facto proscenium framing the view of a low rise street from an earlier era. 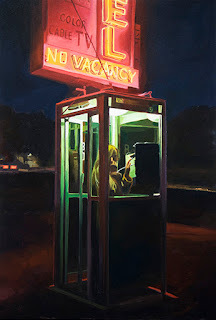 The woman in No Vacancy stands inside a "vintage" and rare phone booth that stands under a motel sign that announces their rooms have cable television. It may be titled Sunrise at the Palace but the Art Deco style theater looks as though its best days were over when the Deco style became passe. The pedestrian ordering of life that goes back hundreds of thousands of years has only recently been forced to live side by side with a new type of road and a myriad of new metaphors. Easier to impose on the sparsely settled North American continent by newcomers than on Europe, where most of them came from, the freedom to move from place to place and the freedom to use space as you see fit are not necessarily harmonious. Streets are not just for movement from place to place; they are also places of work and socializing, sometimes they are even used for a refuge of privacy and solitude, uses that became problematic once humans got behind the wheel. I'm guessing that The Red Chair is not a castoff but rather a seat for sociability. 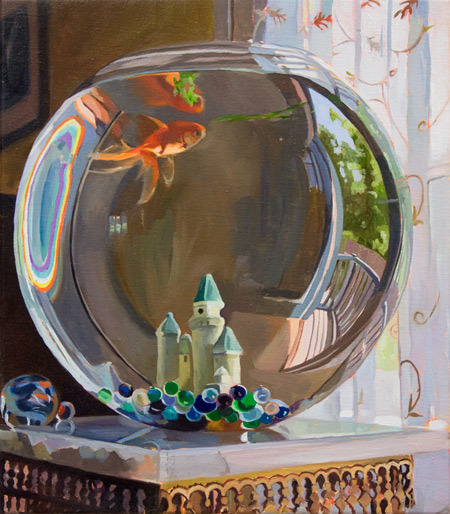 And I fancy the idea that the goldfish in Fish Bowl, looking out the window may have the red chair in view. John Brinckerhoff Jackson (1909-1991), was a pioneer in the study of cultural landscape and founder of the magazine Landscape in 1951. He was known for his complex and humane stance on the state of what we call the environment than some radicals of recent decades, commenting that "death is seen as merely the first step in the producing of compost," a credo that resembles an early but short-lived Christian heresy. 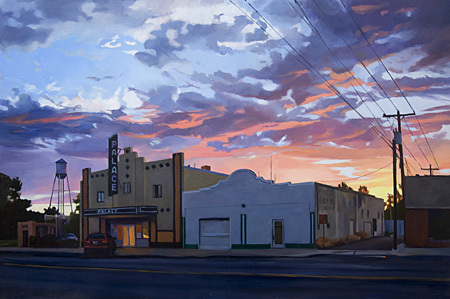 Jackson, who was born in Dinard, France, taught at Harvard and lived in the American southwest for several decades. His peripatetic life supplied the intimate familiarity with both new and old landscapes that characterized his writing. Jackson had a toleration and, more than that, a taste for the contradictions in human actions. Although she was born in San Francisco, Patricia Chidlaw's childhood was, like Jackson's a peripatetic one; her father was a military officer who was stationed in Germany and then in France, where Patricia first encountered art in its museums, cathedrals, and even flea markets. 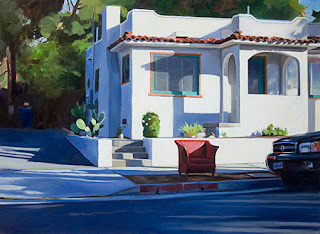 When she began her university art education in 1969, she settled in Santa Barbara, where she now lives. "Paris will be very beautiful in autumn...The town here is nothing, at night every thing is black. I think that plenty of gas, which is after all yellow and orange, brightens the blue, because at night here the sky looks to me - and it's very odd - blacker than Paris. And if I ever see Paris again, I shall try to paint some of the effects of gaslight on the boulevard." Ethereal and atypical, this delicate pastel by Jozsef Rippl-Ronai is suggestive of much that is specific to the period when it was created (c.1892-95). If you think of the works being created at the time by the Belgian symbolists, you can imagine its atmosphere is vaguely anxious. The cluster of tree trunks appear as insubstantial as a group of hovering ghosts. Rippl-Ronai creates this effect by making them appear as they would in a photographic negative: they are pale against the dark night. And speaking of the Belgian, we will see similar trees in the 20th century paintings of a another Belgian, Leon Spilliaert (1861-1946), their (primarily) vertical lines suggesting interpretations as various as their individual trunks. 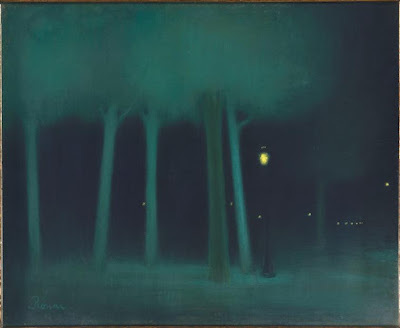 Like William Degouve de Nuncques' pastel Nocturne in the Parc Royale, Brussels, also in the collection of the Musée d'Orsay, Rippl-Ronai's Un parc la nuit is a love letter to artificial illumination. We moderns may think about light pollution or the Dark Sky Society that supports the mission of astronomers but to people of the 19th century, gaslights offered the tantalizing prospect of nightlife, the nocturnal excitement offered by theaters, cafes, clubs, and bars. We enjoy Un parc la nuit for the evanescent aesthetic it embodies but it can enrich our experience if we understand some measure of what its contemporaries saw in it. Jozsef Rippl-Ronai (1861-1927) was from Kaposvar, Hungary. He arrived in Paris in 1888, where he lived until 1901. His painting My Grandmother attracted the interest of Pierre Bonnard, Maurice Denis, and Edouard Vuillard, who invited him into their group Les Nabis (Hebrew for Prophets), where his nickname was, naturally enough, the Hungarian Nabi. When Rippl-Ronai returned home to Hungary he brought back with him the latest developments in art. Nothing the Hungarian artist ever did rivaled the glitter and magic of Un parc la nuit. While in France he also became friends with the sculptor Aristide Maillol. His portrait of Maillol won a gold medal at Vienna in 1914. In 1925, Rippl-Ronai was invited by the Uffizi Gallery in Florence to contribute a self-portrait to their gallery of self-portraits. To read more about the friendship between Jozsef Rippl-Ronai and Aristide Mailloll. 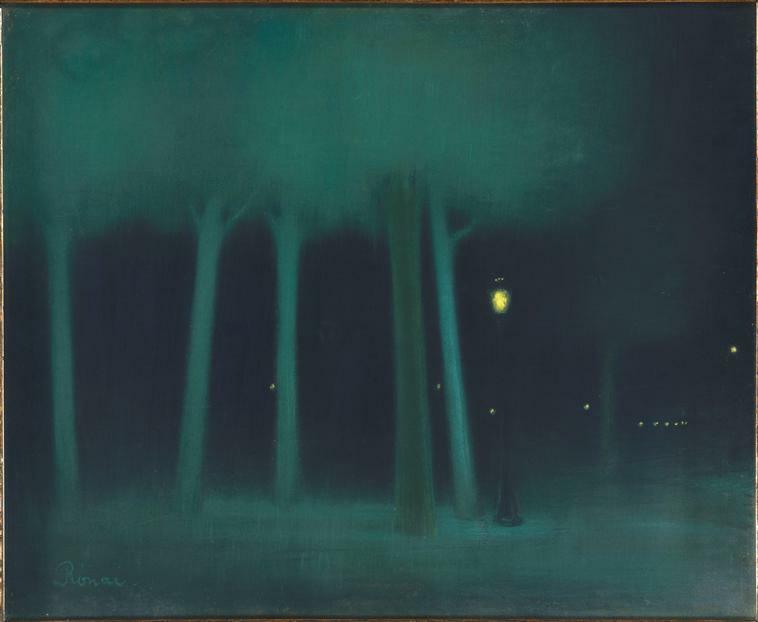 Jozsef Rippl-Ronai - Un parc la nuit (A Park at Night), c.1892-185, Musee d'Orsay, Paris.